Bugambilia, which is the Spanish name for the thorny, showy vine more commonly called bougainvillea, produces wave after wave of color throughout the year, as long as its growing requirements are met. Bougainvillea can grow into a sizable shrubby vine if allowed to spread, reaching up a wall or forming an immense mound of greenery. It does best if kept slightly rootbound, and it thrives as a container plant. 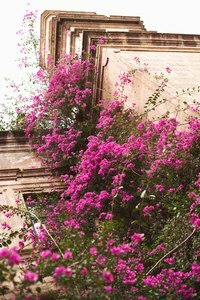 You can prune your bougainvillea into a small shrub, train it as an espalliered specimen on a trellis or wire form, trim it into a topiary or bonsai, or prune and grow it as a small tree. There are many cultivars and varieties of bougainvillea, in every color except a true blue. A tropical plant native to South America, bougainvillea is hardy in U.S. Department of Agriculture gardening zones 9 to 11, but it is easily grown outside that region by growing it in a container and bringing it indoors for the winter. Grow in full sun. Bougainvillea must have at least five hours each day of full sunlight for full flowering but will do even better with more. If grown in shade, the plant will survive but not produce flowers. Plant bougainvillea in soil that is well drained. Purchase a soil mix made for container plants that includes perlite, peat moss and pine bark or similar organic compost. Feed monthly with a water-soluble fertilizer. Dilute the fertilizer by half the package directions to avoid promoting foliage growth at the expense of flowers. Prune the bougainvillea throughout the year to promote your desired form. Pinch out stem tips to encourage the plant to become bushy, rather than producing long stems. Pruning and pinching the plant during its rest phase between bursts of flowering will encourage new growth, bringing more flowers. Water thoroughly only when the soil is dry. Bougainvillea does best when stressed by drought and heat. Excessive dryness can cause the vine to drop its leaves, so water right away if the vine begins to wilt. Transplant carefully, as bougainvillea does not produce a tight root ball and has a very delicate root system. It does best when kept in a pot that is on the small side and can be kept in a 1 gallon nursery pot for several years. When transplanting or repotting, support the root ball with your hands, as the roots will tear away from the stem, causing the plant to go into shock. Set the plant carefully into its new pot and fill with soil just up to the base of the stem. Prepare the bougainvillea for wintering inside by pruning it heavily, as much as down to 8 inches tall. The plant will probably drop its leaves when moved indoors, but it will recover in the spring when it is warm enough to place it outside again. Do not move it outdoors until danger of frost has passed for your area. Frost will burn or even kill the bougainvillea. The colorful "flowers" of bougainvillea are actually modified leaves called bracts. These bracts are papery in feel, and grow in a triangular group of three surrounding the true flower, which is small and white. Wear gloves when pruning or handling bougainvillea, as all varieties have very sharp thorns. How Much Water for a Bougainvillea?